Happy Ratio Rally Day, everyone! It’s that time of the month again … when gluten-free bloggers tackle a common theme and come up with all sorts of versions of delectable baked goodies. 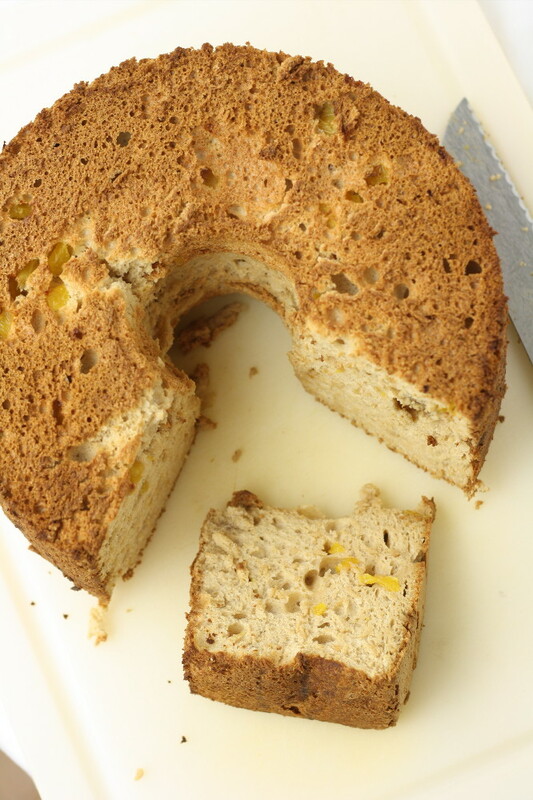 This time around, we’re focusing our energies on angel food cake, a sweet, light, airy, egg-white-based cake. I know we’re biased, but we think we have a pretty awesome traditional (albeit gluten-free) angel food cake in our cookbook, Artisanal Gluten-Free Cooking. 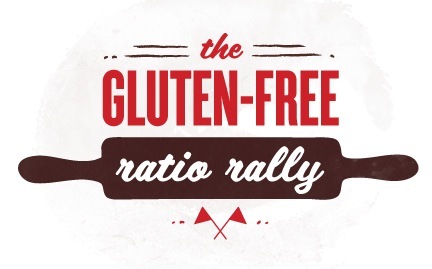 For the Ratio Rally, we wanted to think outside the box (or at least outside the angel food cake pan). It’s summer, and peaches are in season, so that was a natural fit for our style. We also opted to forgo white sugar in favor of brown sugar for more of a “caramel” look and taste to the cake. Dare I say, we were successful! Admittedly, we didn’t pay particularly close attention to the ratio this time around. We were more focused on having the brown sugar and the moisture from the peaches not sabotage our whipped egg whites and their cake batter. But in the end, we got a decent ratio nonetheless. Our ratio of brown sugar : egg whites : flour turned out somewhere in the vicinity of 3.5 : 3: 1. We’ll take it! And for more angel food cake goodness, be sure to head over to Gluten Free[k], where Caleigh is hosting this month’s Rally! Happy baking! 1. Preheat your oven to 350 deg F. Remove the top rack, leaving the lowest rack. 2. In a mixer with the whisk attachment, whip your egg whites, vanilla, almond, cream of tartar, and salt until you get soft peaks. 3. While the egg whites continue to whip, add 173g (3/4 cup ) brown sugar, a little at a time, until stiff peaks form. Take the bowl off the mixer. 4. In a separate bowl, combine the remaining 287g (1 1/4 cups) brown sugar, plus the flour and xanthan gum, until the mixture looks like sand. 5. Sift the mixture into your into egg whites a little at a time. After each addition, fold the mixture into the egg whites, taking care not to collapse the egg whites. 6. Fold in the diced peaches. 7. Spread the cake batter into a 10-inch angel food cake pan. 8. Put it on the lowest rack of the oven and bake for 40 minutes, until cracks in the top are dry and a toothpick inserted into a crack comes out clean. 9. Remove from the oven, invert, and let cool completely upside down. 10. 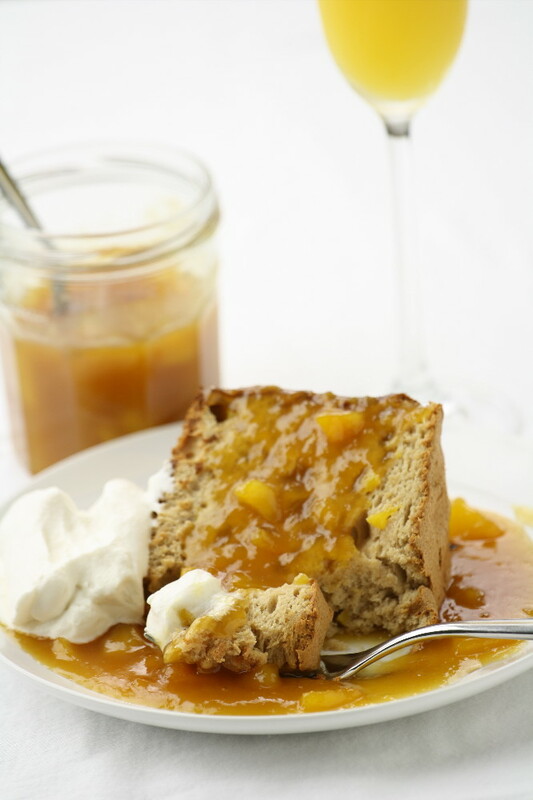 Serve with peach sauce (recipe follows) and whipped cream. This recipe is: gluten-free, dairy/lactose/casein-free, peanut-free, fish-free, shellfish-free, soy-free, vegetarian. To make this recipe nut-free, omit the almond extract. 1. Heat the sugar, butter, and schnapps over medium heat while stirring, and let simmer one minute. 2. Add the peaches, bring to a boil, then turn down to medium, and simmer for 4 minutes, until the peaches are very soft. 3. Use an immersion blender to partially puree the sauce. 4. Return to the heat, and simmer over medium 5 more minutes, until it achieves a syrup consistency. To make this recipe dairy/lactose/casein-free, use a non-dairy substitute for the butter. Brown sugar is a brilliant idea! More angel food cake is in my future! looks wonderful… what a great way to use all of the fresh peaches around here! thanks for sharing. Will this work sugar-free? Say with Truvia or liquid xylitol? Trying to kep blood sugar spikes low and still enjoy baked goods. I don’t think using a liquid sweetener would work, since the sugar makes up the bulk of the dry ingredients. Using the Truvia baking blend might be possible, but you’d likely have to tweak the recipe’s ratios since you typically use half as much Truvia as you would sugar when making a replacement in a recipe. Good luck, and happy baking! Delicious combination of flavors! Love taking cues from the season to inspire what we create in the kitchen. Thank you for sharing! A double hit of peach, brilliant! Your cake looks delicious, I must make this – soon.